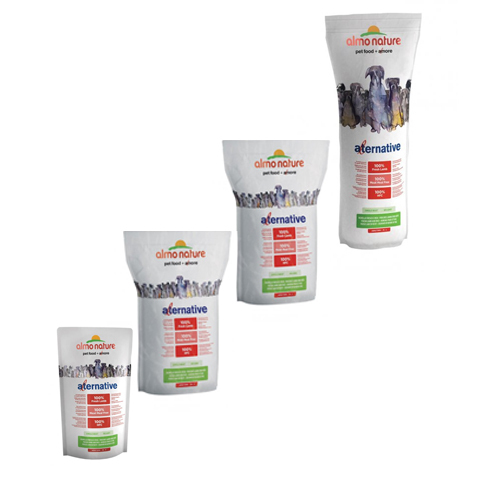 Alternative from Almo Nature is a complete food for adult dogs. One bag of Alternative contains at least 50% meat, which was originally suitable for human consumption. Lamb is the only protein source, making this food ideal for dogs with a food allergy or intolerance. Lamb is the main ingredient of Almo Nature Alternative and contains more iron than chicken and pork. Iron in food contributes to a healthy metabolism. Because Alternative contains a single protein source and a single cereal type (rice), the food is suitable for dogs with a food intolerance or allergy. No offal is used in the production of Alternative from Almo Nature. This dog food contains at least 50% fresh lamb with the so-called HFC label. This means that the meat is approved for human consumption. This pure and fresh quality meat does not contain any genetically modified organisms (GMO) and is therefore suitable for dogs with a hypersensitive reaction to food. Fresh lamb 50%, 45% rice, yeast, beet pulp, potato protein, animal fat, minerals, hydrolysed lamb protein, wholemeal flax seed, salmon oil, mannan-oligosaccharides 0.1%, chicory inulin - a source of Fos 0.1%, Vitamin A, Vitamin D3, Vitamin E, Vitamin B1, Vitamin B2, D-calcium pantothenate, Vitamin B6, Vitamin B12, choline chloride, niacin, biotin, taurine, Vitamin K, folic acid, L-lysine, L-carnitine, cupric sulphate pentahydrate, copper chloride chelate from amino acids, hydrated, water-free Calcium iodate in the coated granules (3b203), zinc sulphate, monohydrate, hydrated chelate of amino acids, manganese sulphate, monohydrate, selenium in organic form, calcium 1.2%, phosphorus 0.8%, Omega 3 0.45% and Omega 6 1.1%. Have you used Almo Nature - Dog - HFC Alternative - Lamb & Rice before? Let us know what you think about this product.